Revenge is a strong emotion, one often attached to or possessed by individual soldiers or civilians in times of war. Jack Hinson’s One-Man War: A Civil War Sniper (Pelican Publishing) is a story of Jack Hinson, a man living along the Kentucky-Tennessee border who attempted to be neutral in the Civil War. Two of his sons were captured by a Union (Yankee) patrol, executed on the roadside, decapitated, and their heads placed on the gateposts of their farm. Such a sad story, but what’s worse–it’s a true one. Now, the war became very personal, intensely personal. Hinson had a gunsmith specially design and make a .50 caliber rifle, designed for long-range accuracy. Hinson said goodbye to his family, and set out to obtain revenge. And the Federal Army learned the high cost of vengeance. With that rifle, Hinson killed over 100 Federal soldiers, marking each kill on the barrel of his rifle. Confederate sniper, scout for General Nathan Forrest, Hinson was hunted by the Federal Army. Alone, he captured an armed Union transport, and he also warred against the guerrillas terrorizing the border states. Hinson did not record their deaths. Hinson’s recorded kills probably makes him the most successful Confederate sniper of the Civil War. 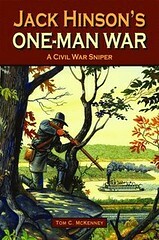 If you enjoy reading about the Civil War, you will enjoy Jack Hinson’s One Man War. McKenney’s well-written and detail-packed account is carefully researched and this is a story that is sure to touch your heart.